Well since the last blog on 6th Jan we had another Two full weeks of fairly heavy snow and bad weather. Another Two weekends lost. 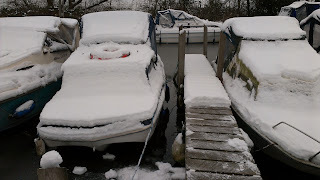 We did make the effort to clear the boat of snow the last Saturday but more snow overnight scuppered our plans to get out and catch a pike in the snow. A quick visit to the boatyard yesterday (Saturday) and i was confronted with the whole boat dyke frozen over. It did not look good for our planed trip in the morning. As we had not been fishing for some time we had a think about where we could go in the morning, fishing off the bank rather than the boat. We wanted to be in the "City" somewhere because the air temp is normally a few degrees warmer and thus should be ice free. 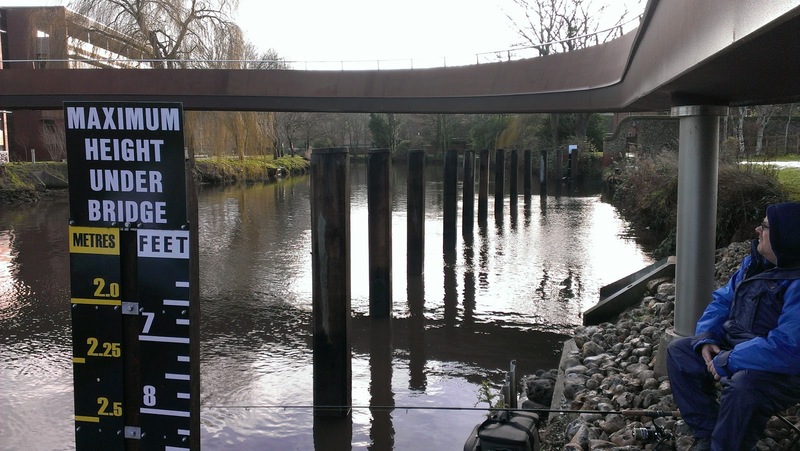 A couple of spots came up, both fairly well at the upstream end of the Wensum. One was near our Playhouse swims we fish by boat and the other near the old Jarrold print works. We loaded the frozen car at around 7am on the Sunday morning and headed towards the first area, the Playhouse. The river looked ok, just a bit more pacey than usual. Colour was not too bad. The problem we had here was parking the car. As with most places in the city, everywhere was parking permits only or zones with the threat of clamping if your not supposed to be there. I did not think the £80 clamping fee was worth the risk so we then headed off to the Jarrolds swim. 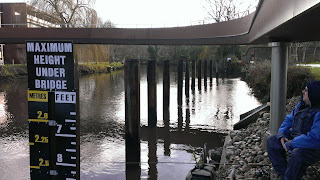 This swim is actually on the opposite bank to the Jarrolds site, close to the law courts. It also had a pay and display with a Sunday charge of £5 all day which sounded much more reasonable than the clamping charge. We had a quick walk to the swims by the bridge and although there was thin ice in the edges the main river was ok, just a bit more flow and the odd debris coming down. 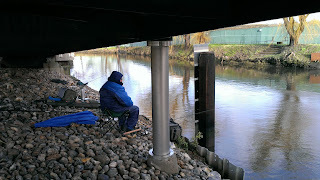 After feeding the meter and unloading the gear, we was soon set up under the bridge with a single rod each, both fishing dead baits. We actually used the cover of the bridge to keep out of the icy wind that was blowing and it actually looked quite promising. Apart from reeling in to remove the rubbish off the line or re positioning the baits, nothing materialized. Four hours soon passed and in that time the sun had arrived and the temp had risen to a mighty +4c. At around Noon i received a text from a mate who was making a late start and he said the boat dyke was now clear at Thorpe. With no signs of anything changing here, we decided to nip to the boat and have a couple of hours there. Forty minutes later and we are both fishing off the back of the boat in now bright sunny skies. It only takes Ten mins or so for my dead Bluey to start twitching and soon after a nice 7lb Pike is netted. Another Twenty minutes and a slightly bigger Pike of 8-9lbs is also boated, again on a Bluey. Its Neils turn next with an almost identical fish as my last one. Neil gets one more take which he misses and that's it for the day. We pack up about half Two satisfied with our short session at the boat and decide maybe we would have been better starting later in these conditions rather than chasing fish.